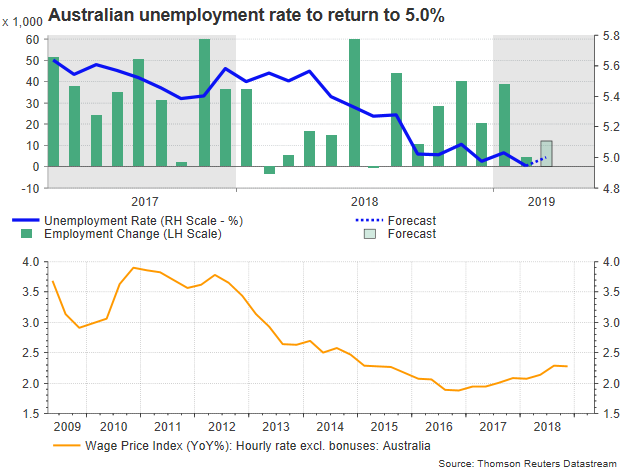 The minutes from the latest monetary policy meeting by the Reserve Bank of Australia underlined the importance of the labor market in setting interest rates on Tuesday, making the Australian employment report due on Thursday at 0130 GMT the next major event for the aussie. After an upsetting 4.3k increase in February, the economy is expected to have created 12k new job positions in March. While, at a first glance, this could be considered as progress, the addition is still among the lowest levels reported over the past two years. The participation rate is not anticipated to excite either as the measure is seen steady at 65.6%. But the unemployment rate, which dropped to an eight-year low of 4.9% last month is projected to return to 5.0%. Since the RBA forecasts an unemployment rate of 5.0% in the current year, such a result would not raise much concern among policymakers. Yet, the outcome would not be welcomed either as the central bank believes that only a rate well below that level would trigger larger wage increases, consequently forcing inflation to move towards the 2.0% midpoint target. In terms of interest rates, the RBA’s April meeting minutes have clearly messaged on Tuesday that a reduction in borrowing costs would be favorable under an upward-trending unemployment rate and a subdued inflation. Even if this is not yet the case as the jobless rate continues to hold a downtrend since last April, a failure to extend the fall in the coming months accompanied with a stubbornly tepid consumer spending and a non-responsive inflation would call for lower interest rates. Given the country’s high exposure to global risks such as the US-Sino trade war, a 25-bps rate cut may be appropriate if economic conditions deteriorate as markets have fully priced in by October. Still, with recent headlines showcasing progress in trade talks between Washington and Beijing, and data out of China – Australia’s major export partner – recovering, the central bank may wisely search for more concrete evidence before taking any action. Besides, with a household debt-to-GDP ratio above 120%, the RBA policymakers would think twice to ease borrowing costs. 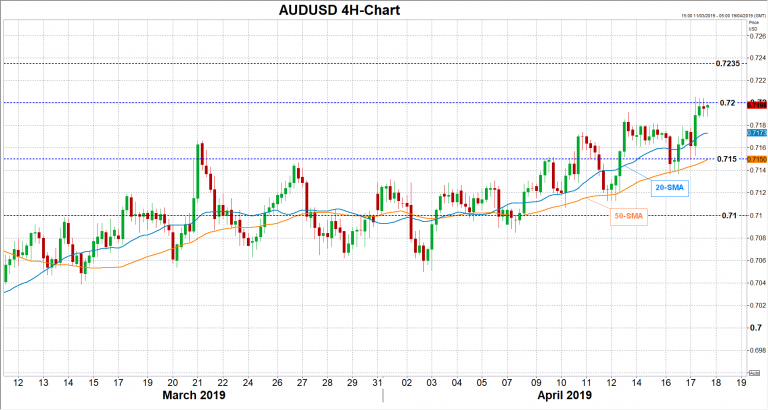 Turning to market reaction, AUDUSD may likely crawl back above 0.7200 and towards the 0.7235 resistance if the employment figures prove further tightening in labor market, particularly through a declining unemployment rate that could slash chances for a rate cut. Breaking higher, the January peak of 0.7294 may be the next target. 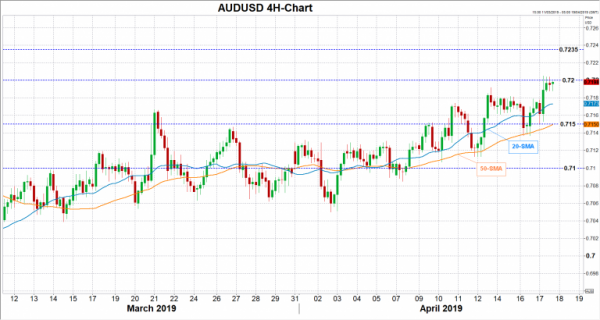 In the wake of disappointing readings, investors would get more convinced that the next move in interest rates may be down, with the price slipping towards the 50-period simple moving average (SMA) in the four-hour chart (currently at 0.7150). Beneath that, the 0.7100 mark could halt downside corrections as well. Next articleEuro Area PMIs: Too Early for a Substantial Rebound?